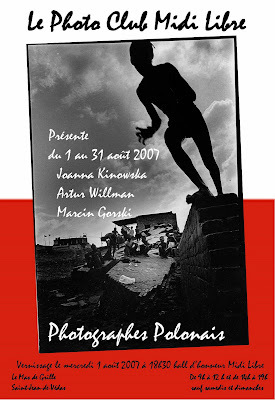 since today till the end of August are opened individual exhibitions of 3 Polish photographers in Montpellier, France. Works of Joanna Kinowska, Artur Allan Willman and Marcin Górski will be shown at the hall d'honour of Midi Libre. Exhibitions are organised by Photo Club Midi Libre thanx to enthusiasm of Vincent Lacour and his friends.